One of our favorite things is to tour older homes and see the original hardwood flooring restored to it's natural beauty, or to see new builds with a fresh wood flooring laid perfectly by piece and without a scratch on it. The shine and the natural grains of the wood can actually be breathtaking, and the colors of wood flooring are impressive. 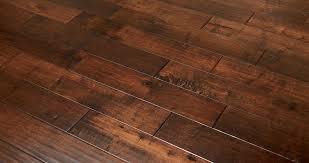 No matter the type of wood you choose, or the stain that you use, your floors will one day get that first scratch. As much as you try to protect them, normal wear and tear, moving furniture, and four legged best friends damage the beautiful flooring. These scratches may not itch, but they certainly are frustrating, irritating, and sometimes downright ugly. Sanding the floors down and refinishing may be an option for later, but to take care of a few scratches here and there, we have some tips that might help. Wax crayons are available for purchase at most hardware stores. These crayons come in multiple shades and you are able to select the closest to your flooring. The other option is to look through your crayon selection at home and find a shade that is close. Soften the crayon with heat (microwave, hairdryer, etc). Scrape the melted wax into the hardwood scratch. Before it hardens, take a credit card or other plastic piece and glide over treated area to remove excess wax and ensure entire scratch is filled. Remelt the wax as needed to fill in the scratch. ** Another tried and true method is to use a cheese grater to grate the crayon, press the shavings into the scratch, and use a hairdryer to melt into the imperfection. If you have the time and desire, the perfect time to wax your floor is after filling in a scratch. If not, ensure you buff out the area and clean completely. This is a quick fix for those scratches, without expensive renovation.